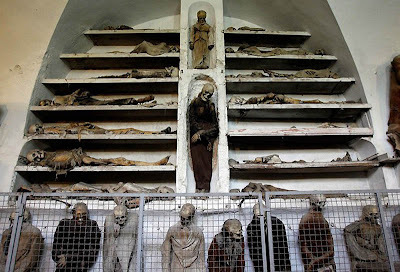 Palermo's Capuchin monastery outgrew its original cemetery in the 16th century and monks began to excavate crypts below it. 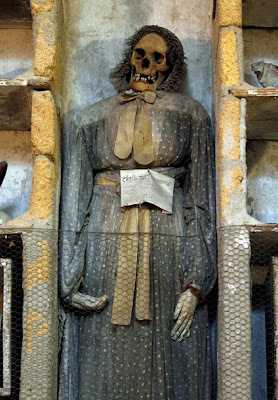 In 1599 they mummified one of their number, recently-dead brother Silvestro of Gubbio, and placed him into the catacombs. 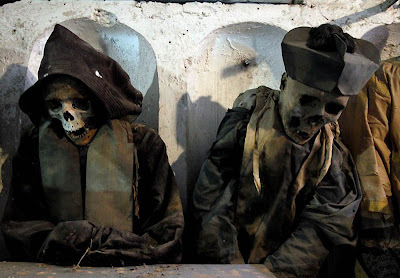 Originally the catacombs were intended only for the dead friars. 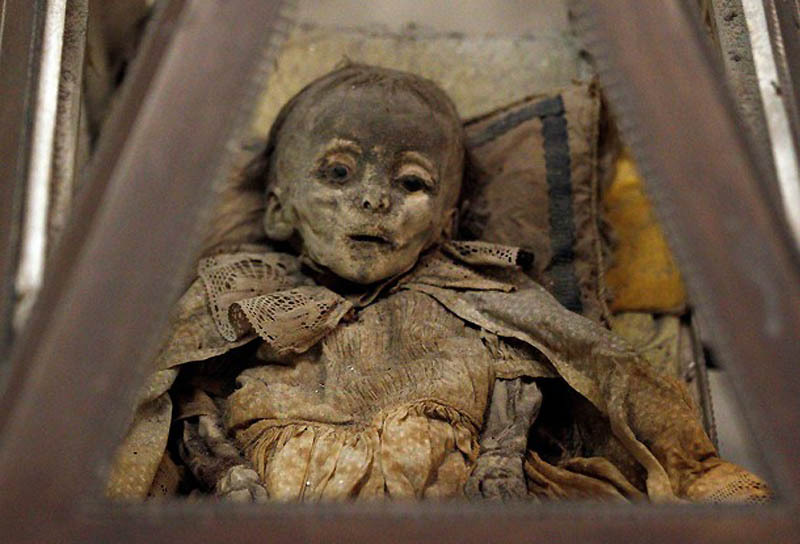 However, in the following centuries it became a status symbol to be entombed into the Capuchin catacombs. In their wills, local luminaries would ask to be preserved in certain clothes, or even to have their clothes changed at regular intervals. Priests wore their clerical vestments, others were clothed according to the contemporary fashion. Relatives would visit to pray for the deceased and also to maintain the body in presentable condition. The catacombs were maintained through the donations of the relatives of the deceased. 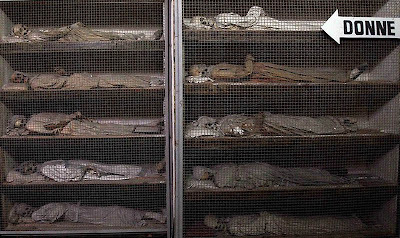 Each new body was placed in a temporary niche and later placed into a more permanent place. As long as the contributions continued, the body remained in its proper place but when the relatives did not send money any more, the body was put aside on a shelf until they continued to pay. Photos of these catacombs are quite rare, because the official photograph of this place is forbidden, but sometimes for professional photographers make an exception. Capuchin catacombs are located under the Capuchin monastery (Italian Convento dei Cappuccini) outside the historic center of Palermo. Piazza Independents (Norman and palaces of Orleans) to pass along Corso Kalatafimi two blocks and then turn on Via Pindemonte. Said street ends Piazza Cappuccino, which is building a monastery. 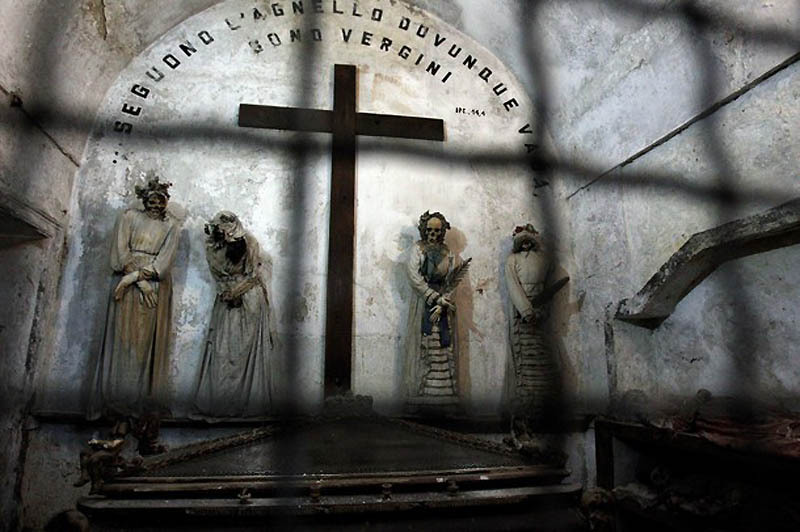 By the end of XVI century, the inhabitants of the Capuchin monastery has grown considerably, and there was a need for a dignified and spacious cemetery for the monks. For this purpose we adapted the crypt under the monastery church. In 1599 there was buried brother Silvestro of Gubbio, and then the remains were moved here several previously deceased monks. In what room crypt was close, and the Capuchins gradually dug a long passage in which up to 1871 placed the body of deceased monks. Already in the XVII century, it became clear that the singularity of soil and atmosphere Capuchin Catacombs prevent decomposition of bodies. The basic method of preparing bodies for placement in the Catacombs was drying them in special chambers (Collatio) for eight months. After this period the mummified remains were washed with vinegar, clothed in the finest clothes (sometimes, according to the wills, the body changed clothes several times a year) and placed directly into the hallways and kubikulah Catacombs. 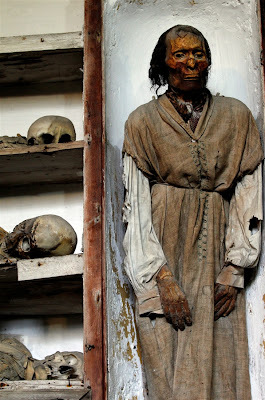 Some bodies were placed in coffins, but in most cases the bodies were hung, exposed or laid in an open form in niches or on shelves along the walls. During epidemics method of preserving bodies is altered: the remains of the dead were immersed in diluted lime or solutions containing arsenic, and after this procedure, the body also exhibited on display. 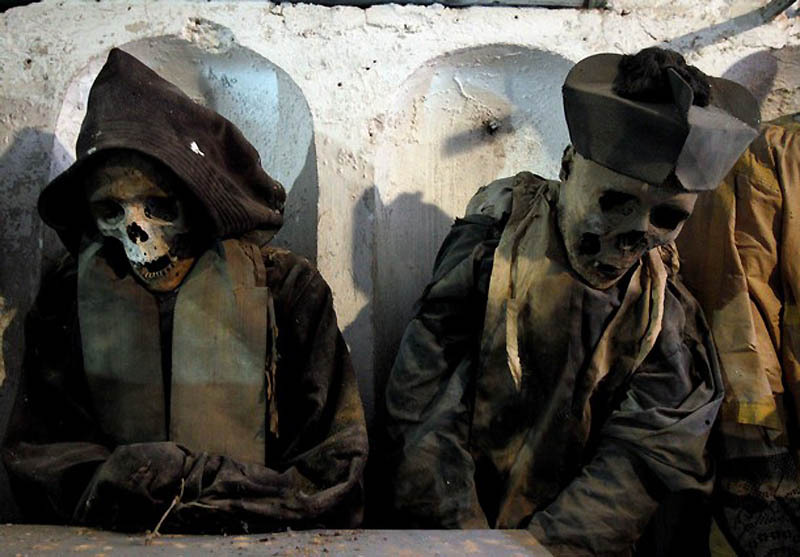 Philanthropists and benefactors of the monastery have also expressed a desire to be buried in the catacombs. For their burials were dug up additional lanes and kubikuly. Up until 1739 the burial permit issued in the catacombs of the archbishops of Palermo Capuchin or managers, then - the abbot of the monastery. 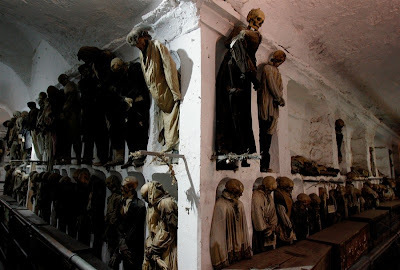 In XVIII-XIX centuries, the Capuchin Catacombs became prestigious cemetery for the clergy, the nobility and the bourgeois families of Palermo. 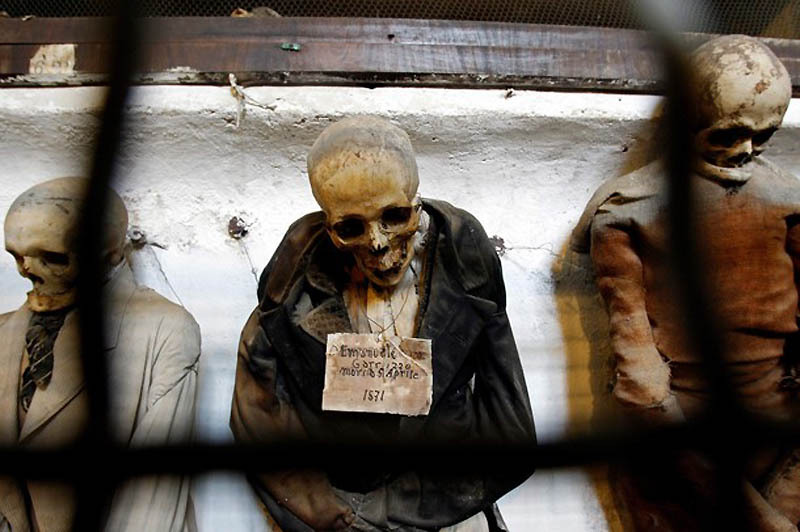 Capuchin catacombs were officially closed for burials only in 1882. Over three centuries in this unique cemetery were buried about 8,000 residents of Palermo - the clergy, monks and laymen. After 1880, for exceptional petitions in the catacombs were placed a few of the dead, including Vice Consul Giovanni Paterniti (1911) and two years of Rosalia Lombardo, the incorrupt bodies of which are the main attractions of the catacombs. After the official closing of the Catacombs (1881) is buried a few more people whose remains have been embalmed. The most recent was buried here Rosalia Lombardo (died December 6, 1920). Doctor performing the embalming - Alfredo Salafia, never discovered the secret of preserving the body, was only known that it was based on the chemical injection. As a result, remain incorruptible, not only the soft tissues of the face the girls, but the eyeballs, eyelashes, hair. 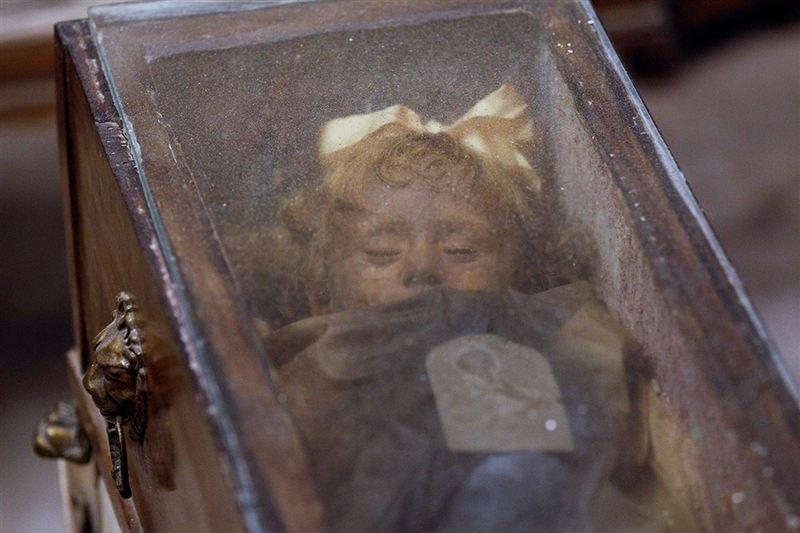 Currently, the secret is open-ended Italian scientists on the study of embalming. Alfredo Salafia found a diary that describes the composition: formalin, alcohol, glycerin, zinc salts and some other ingredients. The mixture was fed under pressure through the arteries and to disperse the blood vessels throughout the body. Conducted in the U.S. research on embalming with the use of the Salafi gave excellent results. As the number of bodies buried here Catacombs expanded - increased existing corridors, and broke new. As a result, the Catacombs in terms of acquired form of a rectangle with an additional corridor (Corridor priests), parallel to the lesser of the parties. Side of the rectangle - the so-called corridors of the monks, men, women and professionals. At the intersection of major corridors created small kubikuly - children, virgins and the Chapel of St. Rosalia. For practical reasons, the entrance to the "dead-end" corridors and kubikuly blocked lattices, and the movement of visitors is organized around the perimeter of the rectangle. Capuchin Catacombs of Palermo residents were considered as a cemetery, though unusual. 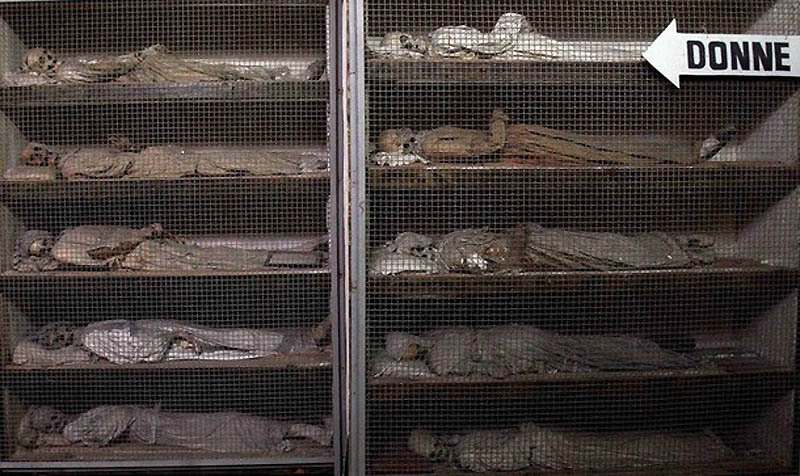 Since the XVIII-XIX centuries buried here was a matter of prestige, are buried in the catacombs of the ancestors of many current residents of Palermo. 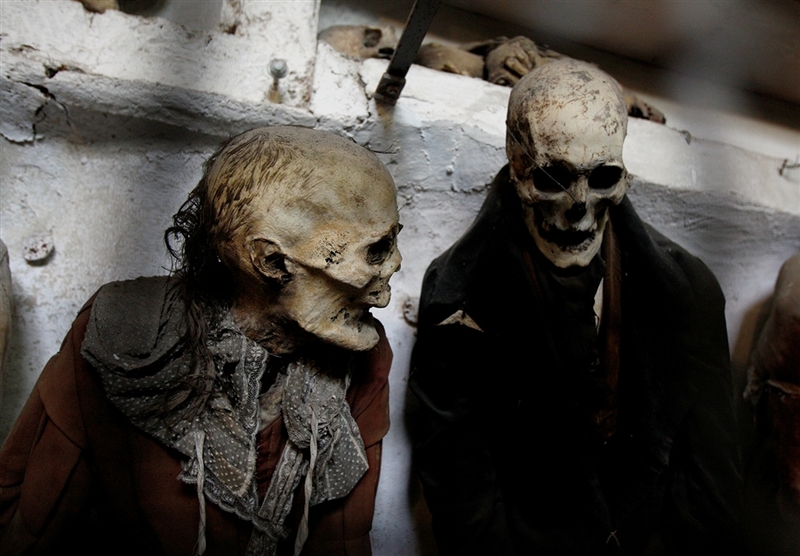 The Catacombs are regularly visited by the descendants of those whose bodies are here. 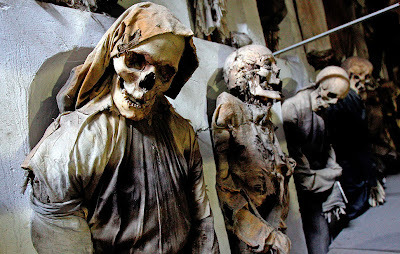 Moreover, after the official closing of the Catacombs for burials (1882), the walls of the monastery was arranged by the "usual" cemetery, so that the tradition of burial "of the Capuchins' remains to this day. 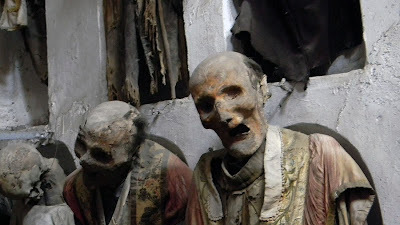 In various towns and villages of Sicily Capuchins established in imitation palermitanskim catacombs other underground vaults, which also displayed the mummified body. The most famous of these tombs are the Catacombs of the Capuchins in the town Savoka (Province of Messina), which holds about fifty mummies from the local clergy and nobility. Unique Cemetery is one of the most famous attractions of Palermo, attracting many tourists. Although the photo-and video in the catacombs forbidden to several European and American broadcasters, including NTV, managed to get permission to shoot. 'Survivor' winners Where are they now?